It is my great pleasure to welcome author, Jonathan Marcantoni to The Writing Life. I followed Jonathan on Twitter where we discovered a mutual friend–author, Mayra Calvani. I’d read Mayra’s interview with Jonathan a while back; it is indeed a small world. I am excited to read his Latino Crime Noir novel, The Feast of San Sebastian. Jonathan Marcantoni is co-founder of Aignos Publishing, and author of Communion (with Jean Blasiar), Traveler’s Rest, The Feast of San Sebastian, and the upcoming Kings of 7th Avenue. His works focus on the struggles of Puerto Ricans on and off of the island. He is also the founder of the YouNiversity Project which helps college students learn about the publishing industry and prepare them for careers as professional authors. He lives in Colorado Springs, Colorado, with his wife and three daughters. 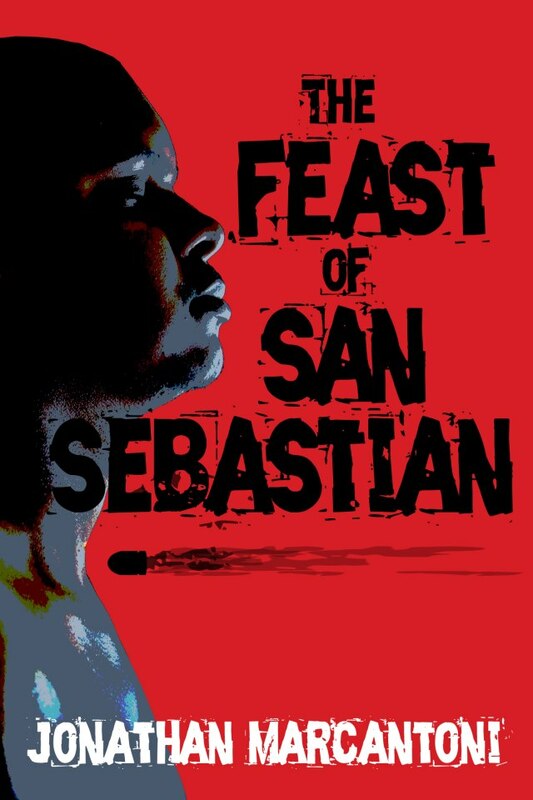 The Feast of San Sebastian is about a middleman, Ilan, who arranges illicit deals for drugs, guns, prostitutes, and anything else his clients need. A former human trafficker, he has distanced himself from that life, but the deals he now makes still haunt his conscience since he knows that he is contributing to the destruction of the country he loves, Puerto Rico. To appease his demons, he turns to drinking and gambling, which land him in debt to San Juan’s biggest crime boss, Antonio. Antonio respects Ilan and approaches him with a chance to free himself without having to pay back another dime: by arranging the assassination of Aurelio Oviedo Narvaez, the corrupt Superintendent of Police. The plot will force Ilan to face his past as a smuggler and confront the contradictions and consequences of his actions, which are a microcosm of the moral and political dilemmas which face all Puerto Ricans. The climax of the book is set during the Calle San Sebastian street festival, which leads up to the religious festival which gives the book its title. I chose that title for the contrast of religious ideology and theory going up against the corrupt reality of everyday life. It emphasizes how far the people in the book have strayed from living honorably and humanely. To educate people on and off of the island of these issues that are so often swept under the rug or deferred to someone else to deal with. Many Puerto Ricans are not even aware that human trafficking is such a huge problem, since the victims are most often the poor from rural communities or foreigners. In the case of the book, the victims are Haitians, who are subjected to extreme prejudice on the island. Our modern mentality is to dehumanize in order to defer responsibility for injustice. It is much easier to say that an atrocity is someone else’s problem, but the world is so interconnected, now more than ever, that everyone is guilty to some degree. Human trafficking occurs because we want cheap products and cheap thrills like drugs and prostitution. General society makes human trafficking possible, without the demand there would be no need to exploit people in this manner. So we are all at fault, including myself. That moment when you finish a scene and know intrinsically that you hit it out of the park. It does not happen often, so when it does, you savor it. Working with an editor and performing self-editing. The whole editing process really is painstaking and rarely fun. When your edits are done and you are happy with the book, the suffering pays off, but the editing process, second only to the post-publishing process of marketing and fighting for readers in a sea of indifference (which I consider to be a part of being a writer, but not of writing itself), is the most humbling part of writing, and therefore the most challenging. That is too long a list to name everyone, but briefly, Toni Morrison, Hubert Selby Jr., Julio Cortázar, Juan José Saer, Fernando Pessoa, José Saramago, Naguib Mahfouz, Gabriel Garcia Márquez, Luis Rafael Sanchez, Miguel de Unamuno, Julia de Burgos, Luis Llorens Torres, Jorge Luis Borges, Juan Rulfo, and Pablo Neruda, to name but a few. My biggest influences have been Cortázar and Selby Jr. I borrow a lot from both of them, but Saer wrote my favorite book of all time, El Entenado, and his combination of poetry, horror, and philosophy is something I am moving toward. My newest works keep inching more and more toward allegory and spiritual meditation, not in a new agey way, but in a thoughtful way. My books so far have been very much about photo-realism, capturing life as it is. But now I am most interested in the transcendence of human nature and that internal struggle to be more than what society offers. I do not have the luxury to have a single place to do my creative work. I am a father and husband with a day job who also co-owns a publishing house, I am all over the place. So I write where I can, though I will say that music being present is a necessity, no matter where I am, even if it is just a tune in my head, music has to be present. Something personal about you people may be surprised to know? My day job is in the military, which is especially contradicting because I am a Puerto Rican independentista with an ideology similar to the macheteros, but you do what you have to do to make a living, I suppose. Even Albizu Campos served in the military, it is an honorable thing. I do not find it prevents me from believing in and supporting a free Puerto Rican nation. Well, I have had the great opportunity of being an author, editor, editor in chief, and co-owner of a publishing house, so I have experienced publishing at every stage. I can say the biggest thing I have learned is to be patient and to be educated. The more you know about the process, the less of a headache it is. A lot of frustrations writers have come from a sense of entitlement that at times is essential, since you should not be a push over and having a sense of self-worth prevents a lot of people from taking advantage of you, but at other times gives both you and other writers a bad name. A writer must know when to be headstrong and when to be humble. Too many writers think because they do not get the world handed to them on a platter, especially the first time out, that publishers are evil or just want to hurt them and their work. There are legitimately bad publishers, but most of them are the biggest champions of literature and who love books in the sincerest, most profound way possible. But publishers have to always keep an eye on the business side of writing, as much as they want to be all about the art, they cannot do that and stay in business. Many writers resent the business side, but that is essential if you want this to be your profession. I guess I did not burn the wrong bridges. Had I, I do not think the book would have come out. I met the right people to support this kind of story and cultivated those relationships, and that is perhaps the biggest reason you are interviewing me right now. Had I been like I was at age 19, when I had my first paid writing gig, I doubt I could land a publisher. I had to humble myself and build friendships to have the opportunities afforded me today. Get educated about the process so that your expectations are realistic. The more measured you can be about the process the better. Clear minds win good deals, and I do not mean that as solely financial. I mean working with the kind of people who fit you and your aesthetic. It may mean you are not making six figures as a writer, but a lot of writers who get the big bonuses end up with books being released that do not reflect their vision, where they had to make big sacrifices in the name of marketability. There is nothing wrong with being marketable, as long as you can live with the sacrifices. Even at a good company, cuts and changes will be made, but when you work with the right people, those changes will not only be less painful, you will find once you do them that you love them. But you need that team, I am a stickler for the team that a publisher gives a writer. That is why so many self-published books are awful, writers take the whole vision thing to an extreme that only feeds their ego. So find that community of people who force you to make the tough decisions because they are right for your story and right for you, and be willing to get your hands dirty promoting the hell out of the book that you and your publisher have put together, that is the only way people will take notice of you. YouNiversity Project and Facebook and Twitter. The Feast of San Sebastian is available in English at Amazon.com and in Spanish as an ebook at Casa del Libro. The book is also available for sale at La Casa Azul Bookstore in New York City and Twig Book Shop in San Antonio, TX. I am currently, along with author Chris Campanioni, heading the YouNiversity Project. We have three amazing students, Yma Johnson and Emma Mayhood from Eastern Michigan University, and Julia Horniacek from Ramapo College, who are embarking on a year-long journey where we will assist them in writing a query letter, building up a web presence on social media, networking with other writers, publishers, agents, graphic artists, and radio personalities to learn about the interconnected world of publishing and entertainment, and workshopping their own writing so that by next year, they can begin seeking out publishers and/or agents. 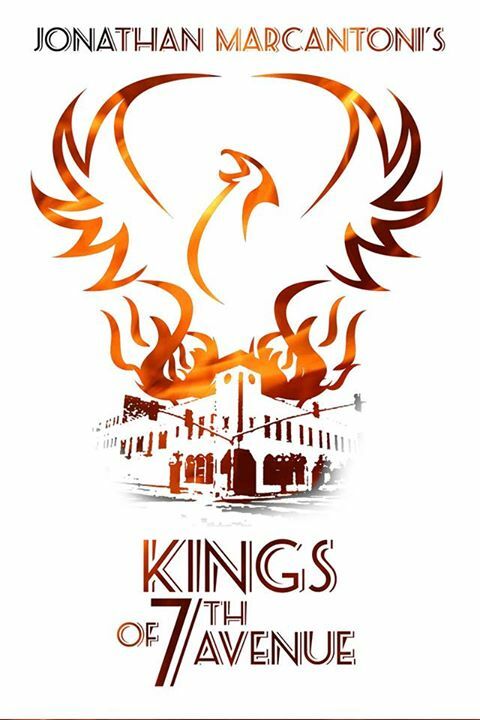 I also have a new book coming out, Kings of 7th Avenue, which is a surrealistic drama set on the Tampa club scene that explores the effects of misogyny and abuse on individuals and society. I am also working on a Spanish novel for Araña Editorial. Thanks for a super interview, Jonathan! It was an honor to have you with us today.